What’s more, Bologna is not only erudite: another one of its nicknames is “la rossa”, “the red one”, a highly deserved nick-name thanks to its politically left-wing orientation, which is supported by a high level of political participation from all its citizens. Since the period following World War II, local governments have considered welfare of great importance in the development of the city. The part played by feminist movements has helped to highlight the importance of a number of key services in the city such as nursery schools; nowadays one of the city’s excellences. As an Italian example of sustainable mobility, about a year ago Bologna launched its ‘Bicycle Orbital Road’, which goes around the city centre, and opened the space called “Dynamo” dedicated to urban cyclists. Every year in July, the city’s main square temporarily becomes an open-air cinema screening a different film to the city each night, including old film rolls restored by the Cineteca di Bologna. In Bologna, the first Regional Hub hosting asylum seekers under emergency conditions opened its doors in June 2014. The hub is a transit centre which allows the primary judicial procedures and the basic health screening process to be carried out with the ultimate aim of facilitating the transfer of the arrivals to other welcoming centres in the different provinces of the region. 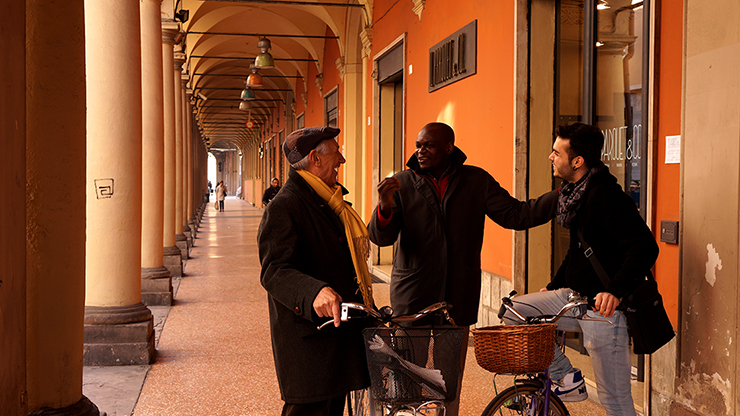 In the area of the Metropolitan City of Bologna, a series of Emergency Reception Centres (CAS) were also opened to host asylum seekers going through the process of requesting international protection. On behalf of the Prefecture of Bologna and various Councils of the Province of Bologna, Lai-momo and other local cooperatives are in charge of providing a complete set of services to support asylum seekers’ in all aspects relating to their life in this new environment. As for other parts of Italy, Bologna also accounts for some 375 SPRAR places for adults and unaccompanied minors. SPRAR is the “Protection System for Asylum Seekers and Refugees” and represents another type of refugee reception system in action in Italy. A list of hotels, bars and restaurants offering discounts for the participants of the Summer School will be available soon. Check this page regularly for updates! Hotel Cavour Discount prices per night from 9th July until 14th July. Please indicate the promo reference “Lai-momo” when booking. Hotel Palace Bologna Discount prices per night from 9th July until 14th July. Please indicate the promo reference “Summer School Lai-momo” when booking. (tourist tax not included). Hotel Donatello Discount prices per night from 9th July until 14th. Please indicate promo reference “Summer school Lai-momo” when booking. Hotel We Bologna 10% discount on any type of beds and rooms available from 9th July until 14th July. Please indicate the promo reference “LAIMOMO18” when booking.